Be My Guest- an Element All Time Favorite! 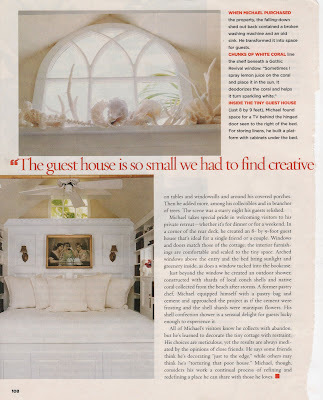 Another bonus of filing away old tear sheets- finding this all time favorite of mine, an 8 by 9 foot guest house in the Florida Keys designed perfectly using every possible inch of space. I cannot figure out what magazine it came from or when, and half the article is missing, so if you know please let me know! How much do you want to spend the night tucked away in here? The bed and shelves are all built in underneath a gorgeous Gothic Revival window. 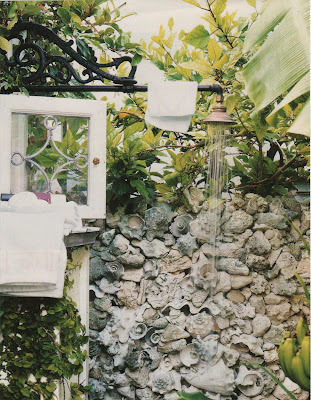 And look at this outdoor shower with a wall made of shells- the owner built it himself using a pastry bag of cement and lots of patience! It’s simply to die for. Random stranger in AL here, who LOVES design and loves your blog :). I’ve seen this article, I’m pretty sure it is Cottage Living. No idea, however, what edition it was in. That shower is heavenly! Thanks Kristin! I’ll check into it! Looks like someone hearts Cottage Living!! This article is from the Jan/Feb ’05 issue. AWESOME shell shower!! LOVE it!!! Wish the climate I live in could support having an outdoor shower all year round!! This is great! This is great that it’s from ’05 and still fantastically wonderful! Awesome find. 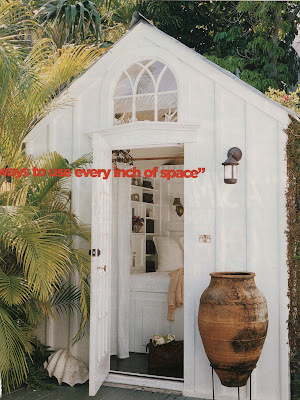 I remember that outdoor shower – it’s to die for! Thanks for the reminder! WOW ERIN!!!! This is beautiful and I’d love to know more about the shower head bracket. beautiful.